Theresa May has begun a round of meetings with Northern Ireland's political leaders as she strives for a breakthrough on the border backstop impasse. On the final day of a two-day visit to Belfast, Theresa May has scheduled meetings with all five of the main parties at Stormont House. Yesterday, Mrs May had conversations with business and community leaders. As well as the Brexit deadlock, the talks at Stormont will also focus on the ongoing powersharing crisis which has left the north without a properly functioning devolved government for more than two years. The north has been in a political limbo land since January 2017, with senior civil servants running public services amid a reluctance by the British government to introduce direct rule. Sinn Fein president Mrs McDonald criticised Mrs May for coming to Belfast with "no plan, no credibility and no honour". She said they had had a "very direct meeting". "We are now 51 days from the Brexit deadline and the British prime minister has come here empty handed with the same old rhetoric with no plan, no credibility and frankly no honour," she said. "We have told her that the British strategy of running down the clock and playing a game of chicken with Ireland and Irish interests is profoundly unacceptable and wrong. "We have told her that the days of Britain dictating to Ireland or Irish people, that those days are over and will not return. "We have told her that the backstop is the bottom line, the bare minimum requirements to meet Irish interests, to protect the Good Friday Agreement, to prevent a hardening of the border, to in some way mitigate citizens' rights." After his meeting this morning, UUP leader Robin Swann claimed Mrs May appeared reluctant to talk about efforts to restore powersharing. "The conversation we were having with the prime minister was initially about Brexit, we had to drag her to a place were we actually started to talk about how we get these institutions back up and running," he said. Alliance Party leader Naomi Long expressed her impatience at what she termed the lack of progress in the two years since the UK voted to leave the European Union. "It's very clear from our perspective that the time for reiterating red lines and regurgitating reassurances has long gone," she said. "What we need now, and the only lines we are interested in, are black and white on paper, an actual deal. "That is the only thing that is actually going to reassure the public, it is the only thing that is going to reassure business and it is the only thing that is going to reassure those of us in politics who are concerned about what is going to happen next. "We have around 50 days to go, so there is no time to be wasting and if we want to feel confident about the future then it requires the prime minister to take ownership of this, and it requires Parliament to wake up to the impending crisis in Northern Ireland in terms of how people actually go about their day-to-day lives. "This is not about political philosophy, this is about people who live in Donegal and work in Derry, this is about people who live in Newry and work in Dundalk. This is about people being able to do their jobs, it's about workforce planning in our health service, in our schools, it's about all of those things. It's not about philosophical debates in parliament." Mrs Long was asked about a report that the British government was considering technological solutions to the border impasse drawn up by Japanese tech giant Fujitsu. According to a leaked document obtained by the Sun, the system would involve a vehicle tracking system that used GPS and number plate recognition cameras. Mrs Long was highly sceptical of the idea and said the suggestion it could be rolled out in time for Brexit was "absolutely nonsense". "I sympathise with the person in Fujitsu who wasted an hour on drawing up those plans because that pretty much looks like how much effort went into it," she said. "It isn't practical, it adds additional cost to business in Northern Ireland, which it can ill afford. It doesn't deal with regulatory checks and with health checks on animals and on other farm goods, so it doesn't answer any of the questions. "What we now have is a kind of back-of-the-envelope diagram that suggest there is some miraculous technical solution." SDLP leader Colum Eastwood, who was third in to see Mrs May, said she needed to understand there was no alternative to the backstop. 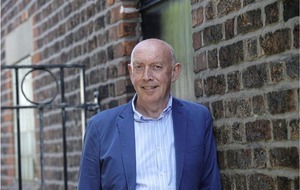 "Last week's vote - the Brady amendment - was a betrayal of everything that was said before that, of the people of Northern Ireland and of all the political progress that we have made," he said. "It just doesn't add up. The last time Theresa May was here she was expounding the values of the backstop and now we are in a situation where apparently the alternatives to the backstop are being explored. 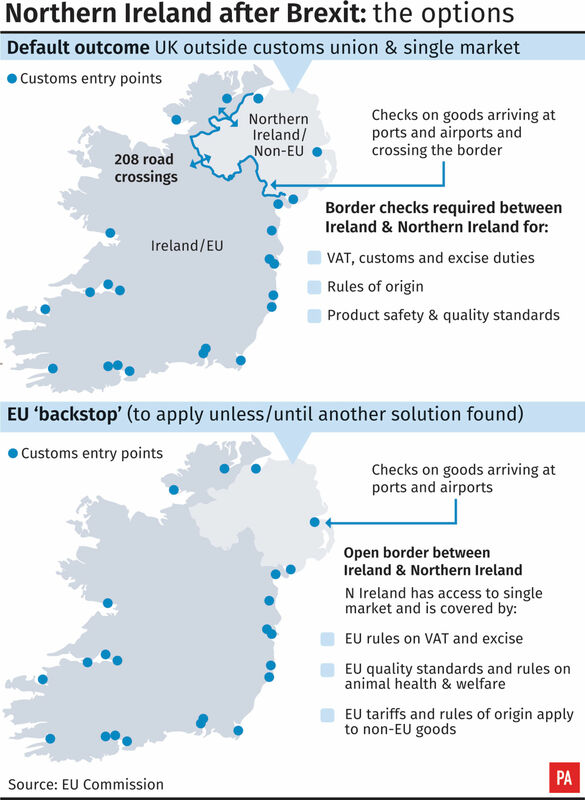 "We made it very clear that there are no alternatives to the backstop. "The bottom line is this - for the people of Northern Ireland, for our peace process, for all of our political progress, we need to remain within the customs union and single market in order to avoid a hard border. "I think that will begin to be understood at all levels in the British parliament because they don't have an alternative. 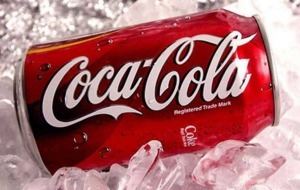 They talk about vague alternatives but there aren't any alternatives." European Council president Donald Tusk said the EU was not making "any new offer" to Theresa May on the Brexit deal. Speaking alongside Taoiseach Leo Varadkar in Brussels, he said: "The position of the EU27 is clear, as expressed in the documents agreed with the UK government - that is the Withdrawal Agreement and the Political Declaration. "The EU27 is not making any new offer." A tweet from Mr Tusk's account said: "I've been wondering what that special place in hell looks like, for those who promoted #Brexit, without even a sketch of a plan how to carry it out safely." Mr Tusk said that the EU27 had decided in December that the Withdrawal Agreement was "not open for renegotiation". He said: "I hope that tomorrow we will hear from Prime Minister May a realistic suggestion on how to end the impasse in which the process of the orderly withdrawal of the UK from the EU has found itself following the latest votes in the House of Commons." 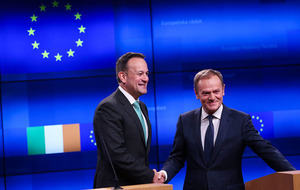 Mr Tusk said the Irish border issue and the need to preserve the peace process remained the EU's "top priority". "The EU is first and foremost a peace project," he said. "We will not gamble with peace or put a sell-by date on reconciliation. This is why we insist on the backstop." In a message to Mrs May, Mr Tusk said: "Give us a deliverable guarantee for peace in Northern Ireland and the UK will leave the EU as a trusted friend. "I hope that the UK government will present ideas that will both respect this point of view and at the same time command a stable and clear majority in the House of Commons. Mr Tusk confirmed that the EU continues to prepare for a possible no-deal outcome. Mr Varadkar said that while he was "open to further discussions" with the UK government, the Withdrawal Agreement remained "the best deal possible". He said: "While we expect that the backstop will never be used, we agreed again today that it is needed as a legal guarantee to ensure that there is no return to a hard border on the island of Ireland while protecting the integrity of our European single market and customs union. "I think the events in London and the instability in British politics in recent weeks demonstrates exactly why we need a legal guarantee and a solution that is operable, that we know will work and will last." Mr Varadkar said that if the UK's intentions for the future relationship "were to evolve", the EU would be "prepared to adapt the content and level of ambition in the Political Declaration while respecting its established principles". He added that he had agreed with Mr Tusk that "in light of the ongoing uncertainty in London and the fast-approaching deadline" preparations for a no-deal Brexit must intensify. Mrs May has suggested she is seeking "changes" to the controversial backstop in her Brexit deal, rather than its total removal from the Withdrawal Agreement. 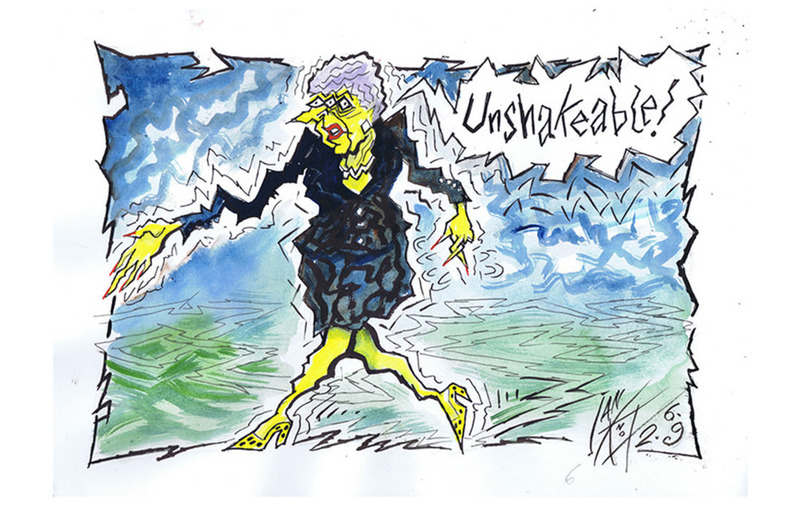 In a speech in Belfast yesterday, the prime minister restated her "unshakeable" commitment to avoiding a hard border in Ireland after Brexit, pledging: "The UK government will not let that happen. I will not let that happen." 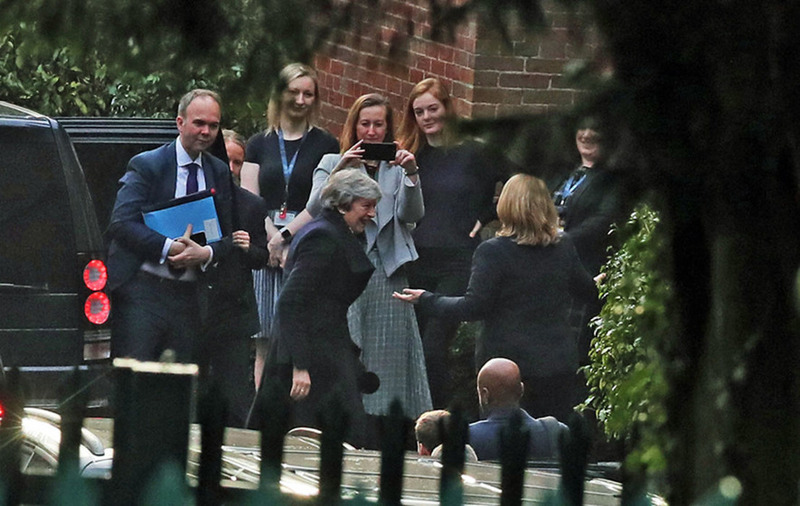 But asked how she could convince the people of Northern Ireland to accept a Brexit deal which was stripped of the backstop, Mrs May said: "I'm not proposing to persuade people to accept a deal that doesn't contain that insurance policy for the future. "What parliament has said is that they believe there should be changes made to the backstop." It is in that light that she is working with MPs, the Dublin government and the EU to find a way to meet the commitment to take Britain out of the EU on March 29 with a deal which avoids a hard Irish border, she said. But the Dublin government accused the prime minister of harbouring unrealistic expectations over the backstop. The mechanism has polarised nationalists and unionists. Many unionists believe the "insurance policy" to preserve a friction-less frontier on the island of Ireland could threaten the integrity of the UK if Northern Ireland's regulations vary from Great Britain after Brexit. Nationalists and many business leaders fear major disruption to trade and a hard border threatening peace process gains if no deal is the outcome and the backstop is not triggered. Supporters of the so-called Malthouse Compromise - which has brought MPs from the Remain and Brexit wings of the Conservative Party together behind a plan requiring the backstop to be ditched - denied the PM's comments had killed off their initiative. As they prepared to meet for a third day in the Cabinet Office, MPs in the group insisted they remain hopeful she will give serious consideration to the blueprint which they intend to complete by the end of Wednesday. With around a dozen civil servants taking part in daily meetings lasting two hours, it is "clear that a lot of Government time and effort and brainpower is being invested in this", they said. 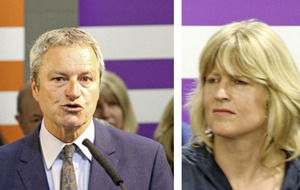 The compromise offers the EU a choice between a Plan A, involving the existing Agreement with an alternative to the backstop and a transition period stretching to December 2021, or a Plan B under which the UK leaves without a deal on March 29 but remains in the single market and customs area to the end of 2021 while arrangements are made for final departure. MPs in the group said their compromise has a good chance of securing a majority in the Commons, making it a more serious proposition for EU leaders than proposals for amendments to the backstop which would be rejected by a wide margin. But they accepted their proposals will not be ready in time to be presented as a Government position when Mrs May meets EU leaders Jean-Claude Juncker and Donald Tusk in Brussels on Thursday. Speaking under condition of anonymity, one MP said the Commons votes scheduled for February 14 are likely to be a re-run of last week's divisions on a series of backbench amendments, with the long-awaited "meaningful vote" on a proposed final deal coming later in the month. Although this would leave insufficient time to pass the necessary legislation in the normal way by Brexit day on March 29, MPs in the group insisted it could be rushed through, saying: "If Parliament has the will to get the legislation passed, it will." Taoiseach Leo Varadkar is in Brussels today for meetings with European Council president Donald Tusk and European Commission president Jean-Claude Juncker. Mrs May is due to visit the Belgian capital tomorrow, where she will hold a series of talks with key figures including Mr Tusk, Mr Juncker, European Parliament president Antonio Tajani and the European Parliament's chief Brexit negotiator Guy Verhofstadt. It will be the British prime minister's first chance to hold face-to-face talks in Brussels since the Withdrawal Agreement reached last November was rejected by the House of Commons. It also comes a week after MPs voted for an amendment tabled by Conservative grandee Sir Graham Brady and backed by the prime minister which "requires the Northern Ireland backstop to be replaced with alternative arrangeiments to avoid a hard border". Mrs May will seek to secure changes which can persuade MPs to support her deal in a series of votes expected on February 14. In Westminster, the working group bringing together senior Eurosceptic and former Remain-supporting Tories will continue efforts to agree alternatives to the backstop along the lines of the Malthouse Compromise. The first meeting on Monday was described as "detailed and constructive" by the Brexit department.